Please note that I’m away for a couple of days, and may not be able to approve comments that fall into the moderation queue while away. I don’t drive as much as many people, but one trip I do regularly is from my place to Marita’s (in Footscray), generally with a big box of fruit+veg from her favourite green grocer in Ripponlea. When I’m in a hurry and/or don’t mind paying the toll: Kingsway, Westgate Freeway, Bolte Bridge, Footscray Road. When I’m not in a hurry and wish to save the toll: Kingsway, Westgate Freeway, Montague Street, Wurundjeri Way, Footscray Road. The toll is $2.15. Not a huge amount, admittedly. But then, it’s not a huge time-saving, either. And sometimes I like to check out the state of the Wheel or see if Melbourne’s fascination with Costco is still leading to queues into the carpark. Not to mention the “spot the people who get into the left-hand lane for Aurora Lane and then try to sneak back out again” game. I suppose I could go via South Melbourne to get to Montague Street, or via King Street, but I’d rather not clog up South Melbourne or the CBD with my car — nor get caught in traffic. Or I could go all the way over the Westgate then up to Footscray. But I suspect I’ll just end up paying the toll. Which is not to say I’m against road tolls for the purposes of reducing demand or getting cars off city streets, but this may have the opposite effect. And while I know my taxes and rego etc don’t pay for the cost of roads, this could be seen as a massive $1.4 billion tax-payer funded subsidy to Citylink. Oh, and thank you too to the government for failing to fund more frequent train services so that this kind of cross-town trip could be done without the current 20-30 wait between trains on weekends. While I realise the shutdown of the M1 eastbound on Tuesday was probably misery for those caught up in it, the lengthy article on it in yesterday’s Age I think vastly overstates the impact. The article basically has the road lobby saying that the whole thing doesn’t work (and the $1.4 billion of improvements won’t last long) and so therefore we should build another one. Because apparently the solution to something that doesn’t work is to have two of them. ”I have consistently said we can’t into the medium and longer term continue our reliance on the M1. It is an unsustainable reliance,” he [Roads Minister Tim Pallas] said yesterday. I think it would be more accurate to say that we can’t continue to have thousands upon thousands of individuals each driving alone in a car for long distances around Melbourne. It’s in no way an efficient method of doing things. And they’ll continue to do so until they’re given a time-competitive alternative. While the government quietly starts building the new road tunnel (claimed to be for freight to the port, but their own artwork gives away that it’s really for city access) and tentatively starts early work on the rail tunnel, they’re neglecting basic public transport service frequency improvements (such as linking two rail lines through the CBD to provide a cross-city route, and boosting frequencies across Melbourne) that would get cars off the road more quickly and cheaper. Both of these can’t be true at the same time. 160,000 vehicles is a tiny proportion of the vehicles in Melbourne. Which is a lot, but it’s also less then a medium-sized football crowd, and it is plainly not true that it impacts the whole city. While I’m sure the talkback lines at 3AW were overheating, myself and many others were completely oblivious to it. Central Melbourne was unaffected. It didn’t affect the trains (which bring the majority of people into the city centre). 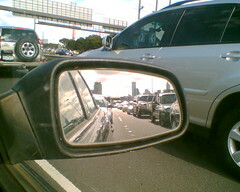 It didn’t affect road traffic on most other routes around Melbourne. The State Government is spending $1.4 billion upgrading the vital transport link with extra lanes and ramps, but even Pallas admits there is only so much ”sweating the asset” can achieve. Ah yes, the M1 upgrade which was going to cost a mere billion, and then blew-out by 40%. So now they’re saying that even that huge expense to taxpayers will provide limited benefits. … the RACV dismissed the upgrade as a quick-fix. “Its life of providing relief is probably only going to last five to 10 years,” public policy general manager Brian Negus said. In the context they said that, they were asking for yet another freeway to be built, but it appears to be admission that it’s pointless to add road capacity — it attracts more vehicles and fills up again. It’s not like building that capacity on a separate road will magically prevent it filling. Unless of course they build it, but keep it closed until there’s a blockage elsewhere. Ironically, according to Currie, the Government’s massive upgrade of the M1 will not help travel times in the long run because the improved road will be an incentive for more vehicles. Spot on. Just like, in fact, the previous improvement (known as Citylink) was meant to speed things up, but didn’t. Ask a regular motorist if they can drive from Dandenong to the Airport in 39 minutes in peak hour today and they’ll laugh their heads off. As I post this, about 8am, the VicRoads web site is estimating around 58 minutes for the trip. (Monash inbound 40 + Citylink Western Link outbound 9 + Tullamarine outbound 9). Admittedly there are roadworks going on, but still! And it’s not even the very peak of the peak yet. It might have been 39 minutes on day one of opening, or perhaps if only those motorists using the road pre-upgrade had been allowed to use it afterwards. But that’s not how things work. New trips are attracted, and it clogs up again. And I come back to my point: the best way to get the M1 running smoothly is to give as many car drivers as possible a fast, frequent public transport alternative.